Jennifer Karady’s exhibition, “In Country, Soldiers’ Stories from Iraq and Afghanistan” at the Palm Springs Art Museum, is a very neat and crisp presentation of her interpretation of the stories told to her by veterans of our nation’s most recent wars. It was respectfully done, showed a lot of thought in its sequencing and, in general, considerate to those who have served in the military for our country. Being a veteran of over 20 years in the Army with tours of duty in both Desert Shield/Storm and Iraqi Freedom, I could relate to the commentary that accompanied the prints. The commentary that I am referring to is the text that accompanies each photograph. These brief passages are a condensed version of extensive interviews conducted by Ms. Karady in preparation for creating the images. 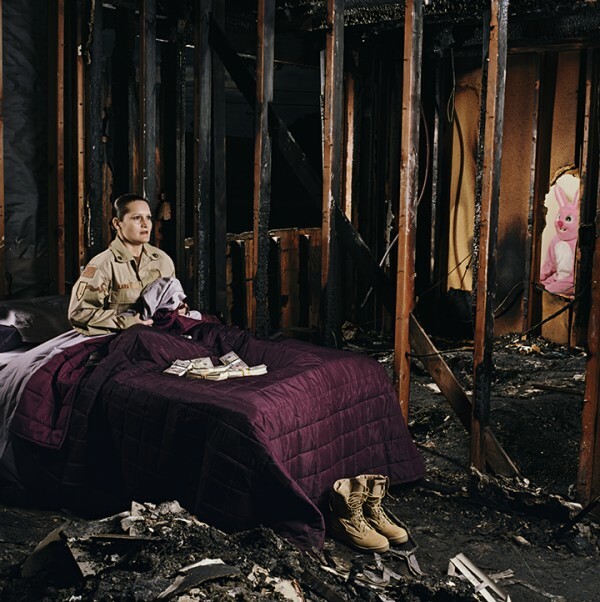 The images themselves are scenes of the service members back home in the US going through ordinary life but juxtaposed with images of a particular incident that occurred during their deployment to Iraq or Afghanistan. It is a telling psychological scene being played out as though you are in the thoughts of the individuals yourself. It also informs the viewer of those invisible mental scars that we don’t see in passing but these men and women will probably live with for the rest of their lives. 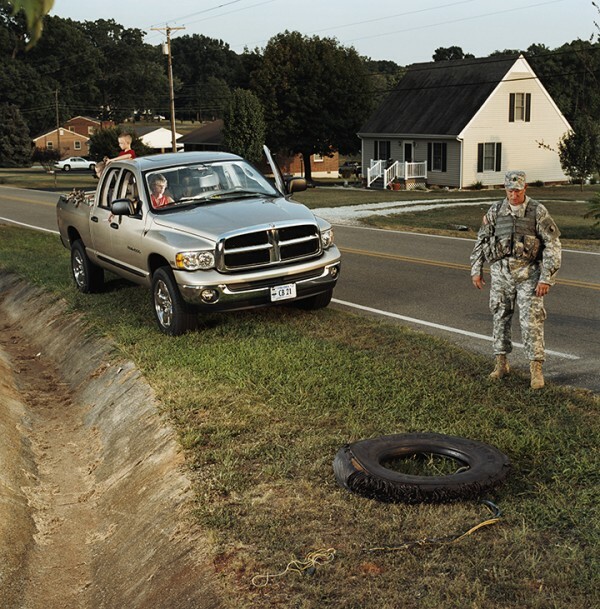 One of the more compelling images for me was Ms. Karady’s photograph of Virginia Army National Guardsman, Sergeant First Class Mike Sprouse. Sergeant Sprouse is a veteran of Operation Enduring Freedom in Afghanistan and was photographed with his wife, Tammy, and children, Peyton and Colin in Madison Heights, VA. The image shows Sergeant Sprouse standing on the side of a suburban street in rural Virginia just a few steps away from his pick-up truck that his wife and family are still in. Everyone is dressed normally save for Sergeant Sprouse, who is in his desert battle dress uniform. He is staring down at an old tire left by the side of the road. In the associated commentary, Sergeant Sprouse explains how he survived improvised explosive device (IED) while deployed and how that incident affected him. The connection I had with Sergeant Sprouse’s image was his rank – I was also a Sergeant First Class – and being a survivor of an IED attack. Sprouse was also one of only two service members in the presentation of 16 images that was still serving. Other images that captured my attention were those of Specialist Aaron Grehan of the 11th Signal Brigade, U.S. Army (the unit that I had served in during Operation Iraqi Freedom); Captain Elizabeth A. Condon, New York Army National Guard; Staff Sergeant Starlyn Lara, 1st Infantry Division, U.S. Army; and last but not least, Lance Corporal West Chase, 1st Marine Expeditionary Force, U.S. Marine Corps. The prints themselves were superbly created. They were shot on large or medium format film and made into large chromogenic color exhibition prints. These were framed and not matted. The exhibition was an exemplary example of how a show can be presented. But it did raise a question for me. The show does not glorify or vilify the military and for that I am grateful. But I do get a feeling of being mislead. The presentation consisted of predominately white American veterans and that speaks to an ongoing (and very old) social commentary in our country: How blacks and whites are represented in America. Lance Corporal West Chase was the only black service member shown. Purely speaking in numbers, that is a little over 6%. This is significant because according to the US census and information provided by the Department of Defense, more than a quarter of the military are minorities. More specifically, though black Americans only make up roughly 13% of the U.S. population, 17% of those serving in the military are black. At a glance, Ms. Karady’s work would suggest otherwise and that is troubling because I believe that one of art’s goals should be to be inclusive, not to stratify. And having spent most of my adult life in the military, it is a glaring omission for me. Out of 16 prints, a truer picture would have been three images of black service members. To Ms. Karady’s credit, I do not know what opposition or obstacles she faced nor do I think this was intentional but in a time where positive imagery can be a tool that can help bridge the divisions in our society, this was an opportunity that was missed on that front. Just the same, the show does a good job of bringing to the attention of the viewing audience the psychological scars that many veterans bear and will carry for the rest of their lives.